Nigerian billionaire Aliko Dangote told CNBC that a wave of asset selling by the government could be the best way to boost Nigeria's recession-hit economy. "I think the real challenge for us is now for us to have the political will in terms of selling some assets," he told CNBC Africa on Friday. "I think it's an easier route than the IMF (International Monetary Fund) or the World Bank to borrow money, because what you need to do is actually to beef up the reserves." Dangote spoke to CNBC Africa before Nigeria's credit rating was downgraded to B from B+ by S&P Global Ratings on Friday. "Nigeria's economy has weakened more than we expected owing to a marked contraction in oil production, a restrictive foreign exchange regime (Exchange: NGN=) and delayed fiscal stimulus," S&P said in a report on the downgrade. Nigeria's economy is set to contract on an annual basis in 2016 for the first time in 21 years, with its all-important oil industry suffering under weak global prices. The country's gross domestic product (GDP) dropped by 2.06 percent in the second quarter of 2016, after falling 0.36 percent in the previous three months. 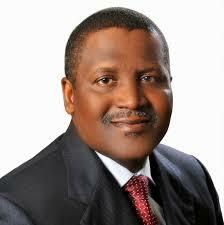 Dangote is worth $12.5 billion and is the richest man in Africa, according to Forbes. He is the owner Dangote Group, which bills itself as the biggest manufacturing conglomerate in West Africa and has interests in commodities. Dangote told CNBC that Nigeria, which rivals with South Africa to be the continent's biggest economy, should have been diversified a long time ago. He lamented its overreliance on oil. However, he was optimistic that Nigeria would exit recession in the fourth quarter of this year and said the country "had all the answers" to bounce back to health. He urged the government to sell assets in some of its joint ventures with the private sector in an open tender process. He said that Africa Finance Corporation - a development finance institution established in 2007 - would fetch close to $800 million. He said policymakers should also look to sell 100 percent of the country's stake in Nigeria LNG Limited, a natural resources firm. "If I had challenges in my company, I would not hesitate to sell assets, to remain afloat, to get to the better times, because it doesn't make any sense for me to keep any assets and then suffocate the whole organization," Dangote told CNBC.